Much has changed in Miami’s downtown skyline since the 1970s. The City of Miami’s Office of Information and Services took a number of photographs during the 1970s to showcase the city. The featured photo was taken in 1979 and is a compilation of prominent buildings in Miami and Brickell at that time. Some of the buildings date back to the real estate boom of the 1920s, and others are more recent. More than half of the buildings in the picture are no longer a part of Miami’s skyline at the time of this article. Below is a brief background on each of the buildings featured in the cover photo. Descriptions of each structure will start at the top left portion of the picture and move left to right, and then onto the second row. 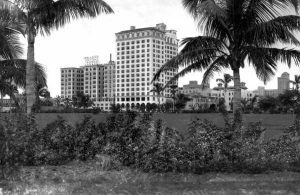 Figure 1: Everglades Hotel in 1920s. The Everglades Hotel opened shortly before the great hurricane of 1926. Although the hotel’s lobby did flood during the hurricane, the hotel provided temporary shelter for some Miami residents following the destruction caused by the hurricane. Also, the building provided a transmitter for WTVJ when the television station first started in 1949. The hotel was demolished in 2005 to make room for a new condominium high rise called “Everglades on the Bay”. After financial difficulties and a restructuring of ownership, the building’s name was changed to Vizcayne. The Four Ambassadors opened in January of 1968. The northern most building sits on land that was formerly occupied by the Brickell Apartments. It was featured in the movie “Tony Rome” while it was being built in 1967. The complex included a Sheraton Hotel that hosted a Ministers Conference in 1968 in which Martin Luther King Jr. spoke a few weeks before his assassination in Memphis. The Four Ambassadors is now exclusively a condominium complex and still resides at its original location in the Brickell neighborhood. Figure 3: Dupont Plaza Hotel Postcard. The Dupont Plaza Hotel opened in 1957 and sat along the mouth of the river in downtown Miami. 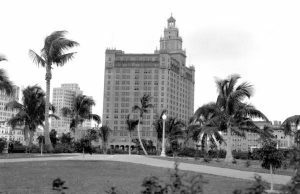 Unlike Miami Beach, which featured many new hotels following the building boom bust of the 1920s, there were not any major new hotels in downtown Miami until the Dupont Plaza Hotel. It was a popular destination for visitors until the late 1960s. Downtown Miami was no longer the hub of activity it once was, and the hotel began to experience financial difficulties. It had a resurgence in the 1980s and early 1990s when it was purchased by Lionstone Hotels and Resorts. The new ownership contemplated an $80 million renovation, but changed their mind. They opted to raze the building instead. Demolition of the hotel began in mid-2004 and was completed by January of 2005. 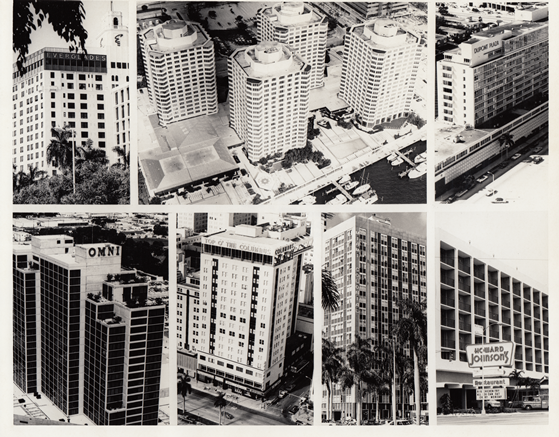 The Epic Residences and Hotel were built on the land formerly occupied by the Dupont Plaza Hotel. It opened in 2008. 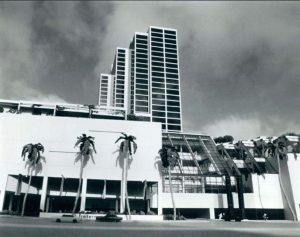 Figure 4: Omni Hotel and Mall in 1977. The Omni Hotel was part of the Omni International Mall. The mall was built in 1977 as an extension of an existing Jordan Marsh store. The Omni Hotel opened a few months before the rest of the mall. The other anchor retail tenant to the mall was JC Penney. Burdines took over the Jordan Marsh store, but closed it in May of 1992. JC Penny stayed open for a few more years, but closed in 1998. The hotel changed brands at least six times since its opening in 1977. The building is now a Hilton Hotel. Figure 5: Columbus and McAllister Hotels in 1920s. The Columbus was a 17-story hotel which opened on February 8, 1926. In a Miami Herald article announcing the opening of the hotel, the writer described the hostelry as “in 17 stories of stone and marble, the builders of the Columbus Hotel have substantiated their belief that Miamians want a hotel worthy of its growth”. It was erected during the great building boom of the 1920s. One of the prominent features of the building was a restaurant called “Top of the Columbus”. Miami residents fondly remember attending special events in this restaurant. None of the newer buildings along the Biscayne Boulevard provide a public place to replicate the view that was once seen from the Top of the Columbus. Directly to the left of the Columbus in the photograph is the McAllister Hotel. It was built in 1917 and was the tallest building in Miami when it was completed. Both the Columbus and McAllister were demolished in 1988. After the demolition of the two buildings, the footprint of the former two hotels was temporary home to the Columbus Bazaar. It was replaced with a fifty seven story condominium complex called 50 Biscayne in 2007. Figure 6: Miami Colonial Hotel in 1946. 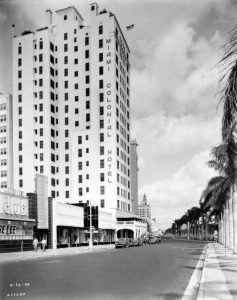 The Miami Colonial Hotel was opened on July 1, 1926. The building was erected by Mrs. C.H. Watson and her son, Oscar. The hotel opened as the Watson in 1926, but only remained under that name until the end of the 1920s. The hotel was purchased by the Pennsylvania Corporation as part of an acquisition of a number of properties in the Miami area. The Watson Hotel, William Penn Hotel, Henrietta Towers and Venetian Way Hotel were all part of a group of transactions that occurred in 1930. The Watson Hotel changed its name to the Miami Colonial as part of the sale. The modern day version of the building has a completely different look than it did during its days as the Watson or Miami Colonial Hotel. It went from a Spanish Colonial exterior to a green and glass façade as it appears today. The new exterior was overlaid on top of the original façade. The hotel changed its brand name a few more times through the years. 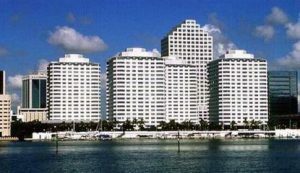 It was known as the Riande Continental Miami Bayside Hotel, Hotel Continental and B2 Hotel over time. The hotel is operating as the YVE Hotel today. Biscayne Tavern is the restaurant in the lobby of building. Figure 7: Howard Johnson’s Restaurant Postcard. 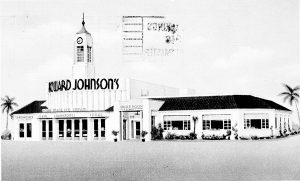 The original structure for Howard Johnsons was built in 1938. It began as a restaurant until the mid-1960s. The restaurant was built across the street from the old Port of Miami on Biscayne Boulevard. It was a short walk across the boulevard from the port to enjoy an affordable meal. 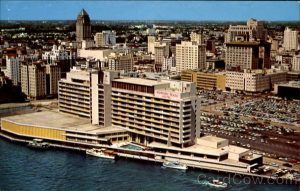 The restaurant was razed and replaced with the hotel in the cover photo, which was constructed in 1965. 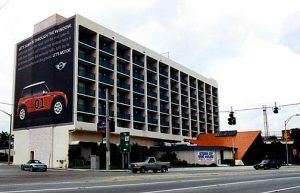 The Biscayne Boulevard Howard Johnsons was one of several buildings that were razed as part of the last building boom in the mid-00s. The 1965 building was demolished in August of 2005. The demolition occurred in the same year that the Dupont Plaza, Everglades Hotel, 550 Brickell and the Brickell Sheraton (on Brickell Point), were all taken down to make room for new high rises. Figure 8: Howard Johnsons on Biscayne Blvd in 2003. The former location of the Howard Johnson’s is now the Marquis Residences. It is also the location of a recently opened STK Steak House. The section of Biscayne Boulevard between Freedom Tower and I-395 was once known as Gasoline Alley. It was given the name based on the concentration of gas stations along the boulevard prior to the last fifteen years. At the time the Howard Johnson was razed, only one gas station remained. The Hess station was removed during the current boom to make room for Zaha Hadid’s One Thousand Museum Tower. 2 Comments on "Miami Buildings in 1979"
Very good information about re-shaping of the Miami skyline. Not only is the Hilton Hotel located at the former Omni International Mall, also the Miami International University of Art & Design (MIU) and US Passport Agency are current tenants at this location as well. many established mansions lining Brickell Avenue !! To name a few: Serralles: P.J., J. E. ( Don Q. Rum ) Ferre (PR,cement) Lluveras( sugar plantation), Roig ( sugar ) Jacobo Cabassa, Miranda,et.al.